Functions are basically a separate area where we write our code and according to the need we can call it. SQL Server allows you to create functions, as we create functions in programming language. We can pass parameter to function and function can also return the output. These are fast as these are precompiled. In scalar function, we can return a single value from the function. Suppose I have to create function which will return the dept according to id. 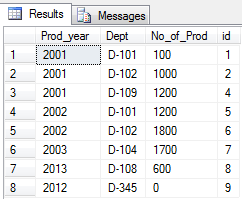 When we need to return the complete table from the function in this situation we create table valued function which returns a table as result set. In the following example I simply passing prod year and according to the prod year it will return the complete result set.